The Plan of St. Gall is unique. There is no other constructional drawing known from the Early Middle Ages in spite of all the buildings that had been built during this period. 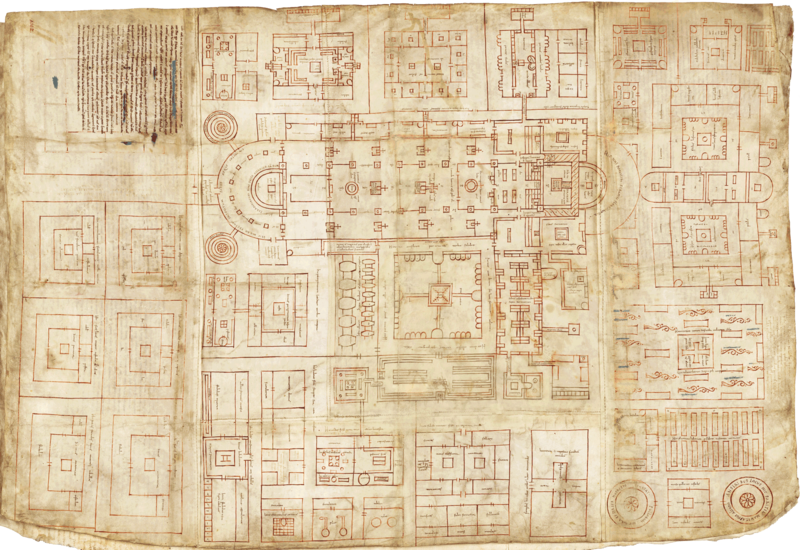 It is the oldest surviving architectural drawing of the Occident. The Plan had been drawn by benedictine monks before the year of 830 AD on the Reichenau Island on the Lake Constance. It is named after the place for which it originally had been created – St. Gall. It is in its Abbey Library where the Plan remains until this day. The Plan, comprising 52 buildings and many details, has a lively past. It consists of five pieces of parchment sewn toghether. The reverse of the St. Gall Plan was used to record the life of Saint Martin by a monk 400 years later. It had only been preserved because of it, as the insignificant “backside” of another text. If you look closely you can see the letters of that text show through. A failed restoration attempt and having been folded into book form gave the Plan today’s look. Hover your mouse over the white dots on the plan to find a description of the functions of the respective building.